Illegal means stops the counter magnet punished. How to detect that the counter stopped neodymium magnet? the main / Miscellaneous articles / Illegal use of magnets for counters punished! Control Seals antimagnit on the protection of water and electricity metering devices! Illegal use of magnets for counters punished! Control Seals antimagnit on the protection of water and electricity metering devices! Do I need to use a magnet? - Highly NO! The properties of neodymium magnets have opened in Japan. On that moment, it was invented and manufactured for industrial purposes. Because of its good resistance to demagnetization, neodymium magnet was an indispensable element in the computer systems and transformers. The shop sold neodymium magnets of different shapes and sizes, which are used for different purposes. Very popular search magnets and toy balls, for puzzles. But even harmless toys can break the control non-magnetic seal. Now these Magnets are widely used in household and construction as aids in the repair. And after a moment, how this became a public magnet, it became big and opened manufacturing and selling. A magnet craftsmen used to stop the water or gas meter mechanism. Of course, Such an alloy is very safe for human health, but thanks to its nickel-copper coating is not a health hazard. Besides, coating makes the magnet resistant to corrosion and various deformations. In everyday life, instead of the direct appointment, neodymium magnet has found the illegal use of electric power in stop, gas and water meters. different devices, controlling energy consumption, water or gas, there are so many. Manufacturers of these devices are trying in every way to construct such counter, which it will be impossible to stop. But the fact, that most of the old meter is powered by a mechanical metal parts counting mechanism ... In such counters put anti-magnetic seals, which respond to magnetic fields and the slightest break the seal can not control. Let us examine the principle of operation of counters for water and electricity. Virtually all the meters operate on the principle of "mechanical counting element - reader reading - output readings (panel)». And if out of this circuit to deactivate at least one element, the score may change. Neodymium magnets can damage the mechanical element countable, disturb the operation of the counter, that could eventually lead to a fine, Cutting off the water or electricity, and serious consequences, even if you did not work. Attention! When applying dissimilar strong magnets your computer can come into disrepair, and the use of the magnet can, It is detected and recorded. Do not experiment with stopping the counter magnets or anything either, otherwise you will be breaking the law! This article is informational and warning, containing no specific methods. Written after numerous requests and questions from our readers, that we consider. 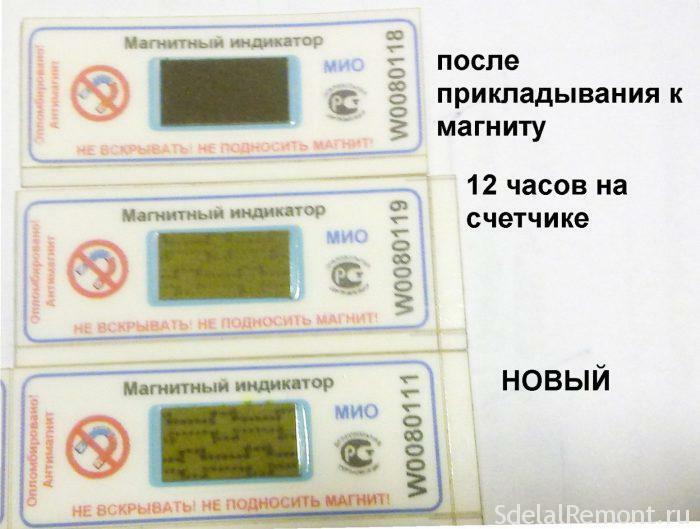 If we talk about stopping the electric meter, the neodimovыy magnet… deleted information ... allowing it to rotate and wind Watts. This is the case with induction electric meters. If the counter electric, then the probability of stopping it is very small. In rare cases,, Using ... deleted information ... size - it is likely to slow down the counter with LCD display. Speaking of water meters, their principle of operation is, in that the counter device has a chamber, like a turbine. The diameter of the turbine blades coincides with the diameter of the chamber, and to which is connected a pipe. Through this tube extends water. And in the use of water, she is, passing through the turbine blade, It causes them to spin. Water flow rate and its receipt directly affects the turbine speed. For turbine blades attached magnet, and a counter is set a second magnet chamber. This second magnet is coupled with the magnetic field, that the blades. And when the first magnet rotates - it makes to rotate the second, the counter chamber in which. Due to the rotation of the second magnet, the monitoring device can take readings and output them on the scoreboard. If we talk about new models of water meters, then there is another principle of operation, and is protected from the effects of neodymium magnets. AT 2017 the Ministry of Construction and Housing and Communal Services has focused its action on, who decided to save by stopping counters. Not without punitive measures: Now, Ulich attempt to save, with the offender will be withdrawn fines tenfold of the amount, which he managed to cheat the state. The fact, that when there is a major indicator of the docking is not counter to the entire home with the sum of individual figures of tenants, all who live in this house billed obschedomovyh needs. By the general building needs include payments for electricity, gas supply, water supply and other costs, who go out, to make the most comfortable to live in an apartment building. This may be the supply of electricity to the front door into the entrance and intercom, staircases, etc..
paying all bills, due to the needs of the common house will pay those debts, who stopped or spun down counters. This is a direct infringement of the rights and freedoms of bona fide residents. According to the deputy head of the Federal Department of Housing and communal services, Andrew lapwing clear and concise: «Pay for itself, without forcing it to do the neighbors». As well, according to Andrew, they, who is engaged in a stop and unwinding performance counter, in fact, engaged in the theft of state resources. therefore, in an effort to protect disadvantaged, State introduces such punitive measures, and tightening the process of bringing offenders to justice for the installation of water meters neodymium magnets. according to Section. P. 35 Rules of public services, owners and users of premises in apartment buildings and homes, the consumer does not have the right to arbitrarily break the seals on the meters and in places of their connection (mounting), disassemble metering devices and to carry out unauthorized interference with the work of these metering devices. Installation of various devices, stopping metering devices communal resources, opening and unnoticeable removal of the seals with metering and subsequent failure to pay the used water, heat, electrical energy is wrongful act, for which there may come, including, administrative or criminal liability for st.7.27 Administrative Code or Article 159 of the Criminal Code, respectively,. The conclusion from the working counter status. Put on the special account, as a violator of the company for the sale of municipal services. Assigned to you imposing penalties. Installation of a new device account. Possible to stop supply of water or electricity. Stop counters considered, theft of energy resources, which resulted in a very significant penalty. Once the magnet is mounted, reduced water or electricity consumption. This fact will cause the suspicion of supplying organization, and you can visit the Comptroller. As soon as the controller finds the magnetic device, then necessarily be the protocol and prescribe a penalty. If the use of neodymium magnets damaged metering device, in addition to the fine you will need to go through the installation and sealing of the device registration procedure. In the private sector it is often found, responsibility for the use of magnets, and the refusal to pay the fine, in such a case it shall be a full cessation of the supply of water or electricity in the house. Modern counters provided with special steel ribbon, which makes magnet inappropriate means. To get rid of such a tape can not be, as the principle of its actions on the seal type. Once you decide, its peel on it there is a special word "autopsy". If the controller sees this inscription, then immediately write you a fine, it will be equal as in the seal removal. In addition, the staff of public services will be held recalculate the consumption of water or electricity on the average performance. The penalty in this case is calculated at an average rate of water consumption and multiplied by 10. Only the timing of charge were not treason. If the test was not carried out over the last few years, it is taken for the calculation of the period, equal 36 months. If the controller has verified in this or last year, then recalculate will be made from the date of his visit. The housing office there is a specific procedure for verification of residents to the fact of stopping the counter. visual confirmation. The easiest way to make a stop in the counter - magnet see on the counter. But this aspect in practice to confirm does not work, because those, who are trying to cheat, will cheat to the end. Remembering their right to inviolability of the home, offenders will not be allowed into the apartment of employees of public services. And the law, in this situation, on their side. Teslametr. If defaulting citizen, letting employees in apartment, He managed to remove the magnet, Stop fact can easily be verified by a special device. The principle of operation is based on teslametra residual magnetization counter, whose performance will be very different from the hours of, which is not subjected to a halt. But in this method of detection magnet it has its disadvantages. The first - is the cost teslametra, which ranges 30 thousand. Not every housing office will be able to afford such equipment. Second - again, checking procedure will take place only in the event, if checks get to the apartment with the consent of the resident. Antimagnitnoe plombirovanie. 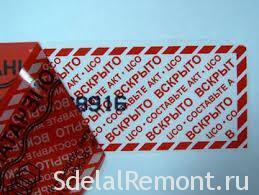 If there are suspicions, executive bodies of public services can set non-magnetic seal on the counter. It indicates an attempt to stop the counter magnet, changing its color. There are of course ways of cheating and seals. Besides, such seals are sold in the public domain on the Internet. Built-in radio module. Recently, meter manufacturers often introduce changes in the meter structure, adding sensor. It works offline. Sends duty warning during an attempt to stop the counter or incapacitate sensor. 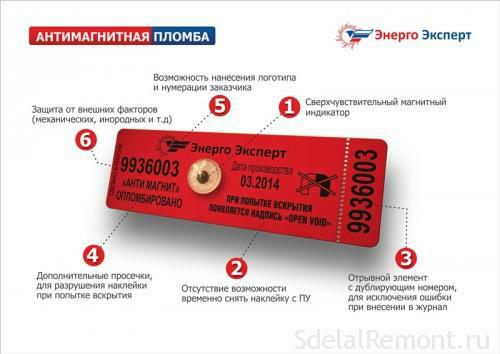 In SVEZA frequent attempts of fraud metering devices often we started to use various types of non-magnetic stickers. Vandal ploby - magnetic field indicator "Energoekspert". Vandal-proof seal indicator "Foreign" or "IVI". Antimagnitnaya seal - IMP-2 (MIG). On an example of "Aqua-1", the counter is possible to understand the principle of operation of counters with embedded radio modules. The first, made in Russia, water meter with integrated data sending sensor. Ease of use of this counter is, that the procedure for taking readings and send them to the relevant authorities of public utilities are automated and autonomous. To send readings used radio module "Swift", which is in contrast to all other data units most budget. It is for this reason that the counter "Aqua-1" is considered one of the most popular among both automated and easy-to-use meter. The sensor itself operates from the internal power supply, power consumption of which is designed for an extended period of time (order 10 years old). The radio signal "Strizh" is able to reach the receiver at a distance of 10 kilometers in urban areas. If the radio module and the receiver are separated by an open area without any obstacles, the display range can reach and 50 kilometers. Contact comfort side to use - it is impossible to stop the counter magnet. To be precise, then stop the "Aqua-1" neodymium magnet possibility exists, but this attempt to save will be fixed and sent on duty. In this report, an apartment and the attempt to stop the counter will be fixed. 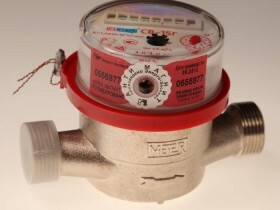 therefore, Amateur stop magnet counters and save money, the model of the water meter is absolutely not claimed. For more information about the methods of stopping the electricity and which lend themselves to stop - telling is forbidden by law. We learned. There are even offices for the sale of neodymium magnets, with their hotlines. For, to buy a magnet, You do not even need to know which counter to be stopped. Just call on the line and answer a few questions, consultant will explain, which counter you describe, and a magnet for that you need to buy, but no one can guarantee, it operates as a constantly undergoing modernization of metering devices. Besides, stop the counter will not work, possibly. The most interesting, after all this, consultant will make recommendations: you need to change the counter to older models, and buy a magnet costing 1 thousand rubles, which significantly saves costs. That is, stop electricity magnets - this is a business. according to estimates, approximately every tenth, cunning and stops the electric meter. And about half are neodymium magnets. And speaking of those, who use magnets to stop the counters, it is worth noting, that not only the residents of houses and apartments use these illegal way. The car repair service, also to energy-intensive work - some illegally stopped counters. And on the question of the basis of this procedure, they are responsible, that the employer requires them to fulfill this condition,, as mandatory aspect savings. There are not bona fide users are becoming more and managing companies are actively fighting this evil - it is their job duties and direct. detection of residual magnetization shows, that the magnet was applied to the device, in order to distort the counter. accessories teslametre, lets you know anything magnetization, even counter. But the fact, that to date, and there is no, established by the legislative body of rules, which would regulate the issue of residual magnetization. It does not exist yet formally fixed and documented procedures for measuring this residual magnetization. If you do not talk about fixed boundary values ​​of permissible values ​​and not permissible. I.e, the majority of the executive bodies of public services, relying on their own conjectures and guesses about, any value may be allowable value remanence, prescribe penalties and interest, in their opinion, offenders. In any case, these offenders will be taken under special control. The author of this article in any case does not call for breaking the law and carry out experiments with magnets and device metering of water or electricity. The article is for informational purposes and does not contain direct methods and ways of stopping the counter. Video: What punishment awaits for installing magnets on meters? And where is the opening theme – how to get around anti-magnetic seal on the meter?! Hello Alex, This article is not an instruction to stop the illegal actions of counter magnet, and is exploratory in nature. Seal antimagnetic not be violated, any use of neodymium magnets will be noticed by controlling bodies. To remove a counter namagnichinost utilize existing demagnitizatory. The principle of operation of these devices is very simple: they minimize the magnetic field is subject to a demagnetized state. Previously, this instrument was used to demagnetize the heads cassette recorders and cassettes. As a result of these steps, the magnetization of the counter goes. 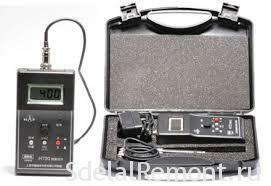 Perhaps this method can and of course damage the metering device is not checked. Hello I want to share their experiences. I wanted to check whether it is possible to use conventional magnets to stop the water meters, I found the old columns black disc magnet is not cool no avail. Read any magnets can suspend water meter, Prices are not cheap but for the water bill too big already. He decided to try and buy a neodymium magnet to stop the water meter, strongly I did not save chose powerful, size 30 on 40 worth 1500 rub. check, Do neodymium magnet stops the water meter and what a surprise it was that the wheel is spinning continued. certainly disappointed. I decided whether friends neodymium magnet can check to stop the digital counter, it turned out that there is no. I asked my friend to try this miracle and was pleased with but after half a year, he said that he had stopped the water meter is spinning at all and now does not know how to be, or will have to pay a fine or have to remove both the magnetization from the counter to make. That's such a sad experience can be useful to whom.